The meta title of your page has a length of 77 characters. Most search engines will truncate meta titles to 70 characters. The meta description of your page has a length of 140 characters. Most search engines will truncate meta descriptions to 160 characters. 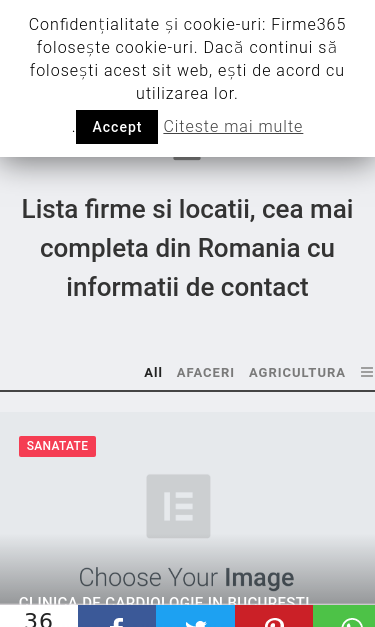 O lista firme completa unde va puteti gasi cel mai bun furnizor sau cel mai bun serviciu de care aveti nevoie pentru afacerea dumneavoastra. Congratulations! Your webpage is successfully compressed using gzip compression on your code. Your HTML is compressed from 482.9 Kb to 46.84 Kb (90% size savings). This helps ensure a faster loading webpage and improved user experience. Your website loading time is around 11.88 seconds and is over the average loading speed which is 5 seconds. https://www.firme365.ro and https://firme365.ro resolve to the same URL. Your webpage is using the canonical link tag. This tag specifies that the URL: https://www.firme365.ro is preferred to be used in search results. Please ensure that this specification is correct, as canonical tags are often hard-coded and may not always reflect the latest changes in a site's URL structure.